In previous article, I described that a Flyout control composed by a TextBox control and a Button control is able to relay a value to a DataContext of a ListView control. It is a useful mechanism as substitute a ComboBox control. 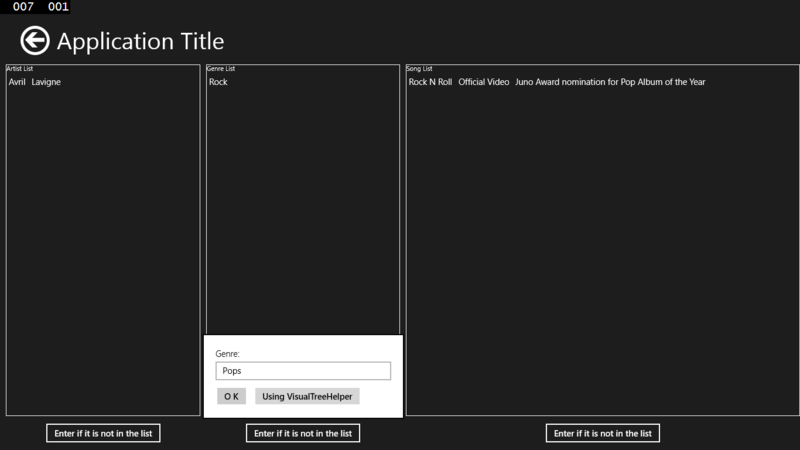 Because some processings are able to run before an item is added to a ListView control. I want to use it many times, so make the mechanism to generic reusable composite. This article describe how to create reusable Flyout control composite. Basic mechanism is same as the sample code of previous article. A difference about XAML is a Name property of the controls set nothing for it would be reused many times. 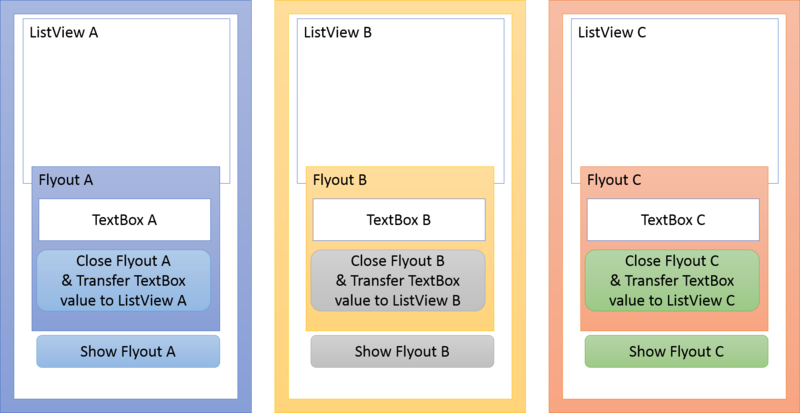 The side of a view model, a Flyout control is showed from a FlyoutBase in order to divide from individual XAML controls. though a button control in the Flyout control should close the Flyout that includes self. To do it, use a Command property and a CommandParameter property of a Button control. The value bind to the Command property of a Button control should extend by the ICommand interface. An Execute method of it take an argument represented by the CommandParameter property of the Button control. When the CommandParameter is set a RelativeSource with the “Mode=Self” condition, it transfer the button itself as the argument of the method. Two ways following is how to close a Flyout control from a button which the Flyout control includes. 1. When a Button control show a Flyout control, the Button control set itself to the private variable of a view model. When the Button control close the Flyout control, the Button control use the variable to determines the Flyout control. 2. The button close the flyout aquire the flyout from the VisualTreeHelper class. The sample code of this article is includes the first way. These two method are below. 1. The sample solution includes. 2. Using the VisualTreeHelper class. XAML is same as above code with exclude a part below. 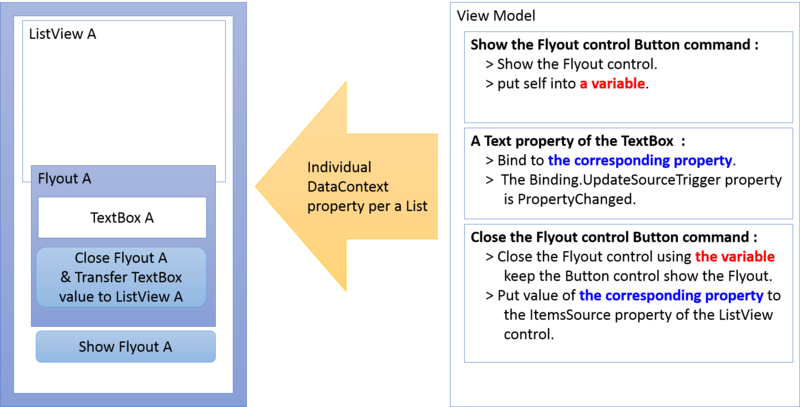 Reusable Flyout composite is provided by the DataContext property of a portion of XAML intent to bind to individual area of the contents semantically. It is like such as a contents of Song, Genre or Artist. These information can build by words of from one to three roughly. Therefore I prepare generic type for “%insertValue%” of above code such as following. The DataContext of reusable Flyout composite is structured with command set ( above), generic type ( above), and properties of TextBox controls( below). // this is properties of TextBox controls. // Implement the PropertyChanged interface. FirstTextBoxHeader = “First Name: “;// Maybe this is got from the resource for globalize. LastTextBoxHeader = “Last Name: “;// Maybe this is got from the resource for globalize. And in the constructor of the DataContext property of the Page, create an instance of the DataContext for individual XAML area. Please reference sample code about the part of following code that obtain the data of stub or local data. I'm Microsoft MVP since June 2010.